ACCESS IS EXTREMELY LIMITED! Lake is steadily dropping and now sits at 82% and with flows being bumped to 541 CFS. Fish will be difficult to find for the shore fisherman with the lake so full so have patience locating fish! With an aggressive stocking of Pilot Peak Strain Cutthroats over the next few years this lake hopefully will produce trophy sized Cutties such as those in Pyramid. 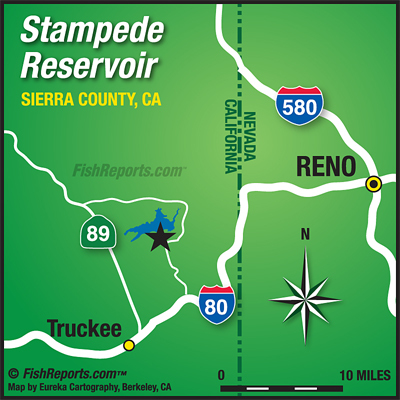 When access opens finding trout from the shoreline can be hit or miss. Right time right place scenario! Not much on the Macks here as the theory is the population was depleted by random die offs during the drought years. Smallmouth Bass fishing can be good in the Davis Creek arm of the lake once temps are right. Hint, fish structure! THE ONLY WAY TO ACCESS CAMPGROUNDS AND BOAT LAUNCH IS BY TAKING 89 TO HOBART MILLS AND THEN THROUGH RUSSEL VALLEY VIA DOG VALLEY ROAD! ROAD HAS SNOW ON IT AND LAUNCH IS NOT ACCESSIBLE YET. CAMPGROUNDS ARE CLOSED! This Lake was Stocked the week of 6/4 and 7/16!